Need convincing it’s almost Christmas? Go to any mall in any country (other than North Korea) and you’ll find red, silver and green tinsel draped between hanging cardboard Santa cut-outs, while Boney M’s Christmas album plays on repeat in the background. Since we’re in the business of manufacturing and printing stunning branded paper bags, we thought we’d take a look at a few fun festive paper bags from around the world. 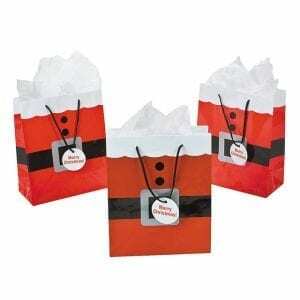 Thinking about using festive-themed paper bags in your retail establishment? This article on why your store needs branded Christmas bags reveals three reasons why that’s a good idea! An absolute classic festive paper bag design, the ‘Santa outfit’ has served gift wrapping manufacturers well for years.Using a simple design featuring predominantly red, with a white upper section, the designer simply added two black dots as buttons, and a black strip wrapped around the bag with a silver ‘buckle’, to create this timeless Santa outfit look.This winning festive paper bag is perfectly finished off with rope handles and a paper tag wishing the receiver a merry Christmas. Using an extensive colour palette, this festive paper bag design is divided into three main sections – an upper cream, middle red, and lower green. 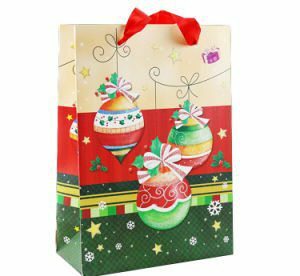 On top of these are three multi-coloured Christmas bobbles that turn this stunning festive bag design into a vibrant eye-catching piece. Finished off with a red Petersham ribbon bag handle, this festive paper bag is sure to make the receiver smile their widest Christmas smile ever! Simple, seasonal, and absolutely stunning! 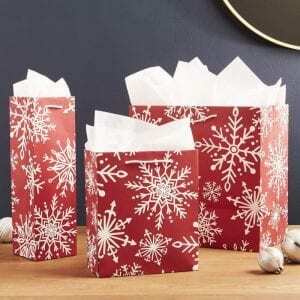 These festive paper bags achieve a festive appeal without even having to feature anything openly Christmassy. Using white snowflake patterns against a solid red background, the designer of this festive bag has captured the festive season spirit perfectly! These festive paper bags are finished off in matt, with white rope bag handles, and sections of white paper sticking out their tops for aesthetical improvement (not that they need it).